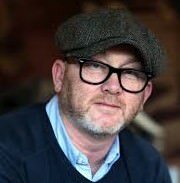 What a pleasant change to watch Salvage Hunters, a television programme which, while making due allowance for the necessary contrivances indulged in by it’s producers in the quest for entertaining content, has something sensible to say about the real workings of the Antiques Trade. When set against some of the frankly nauseating episodes that we have recently endured of the BBC’s “Antiques Road Trip”, which production all too often is inclined to leave the viewer with the impression that Auctioneers are generally inept rather than professional, and Dealers either fools, rogues or a combination of the two, this is as fine wine compared to vin ordinaire. Following the peregrinations of North Wales Dealer Drew Pritchard, the series offers an excellent thumbnail sketch of just how this most fascinating, if at times financially erratic, occupation actually works “at the sharp end”, in accord at so many points with our own experience from which we have learned so much during fifty years of antique dealing. In so many clips, from those illustrating the search for stock, the processes of negotiation or haggling, of restoration and of exhibiting at fairs, to the eventual conservation and sale of the goods, this series comes across as laying bare the real mechanics of “the Trade”. Two points in particular strike home, to which we ourselves have always subscribed with conviction, and they are views enunciated with clarity by Drew, the Dealer whose activities comprise the substance of the programme. The first is that the Antiques Trade is essentially, a knowledge based business, the second that to trade successfully, you must be blessed with that “eye” which means that desirable items “jump off the wall” at you. Successful dealers have both of these attributes in abundance, “knowledge” and, for want of a better word, “taste”, and it is unlikely that without them success would ensue. A third point, no less important, and which once again, is emphasised in the programme, is the realisation that involvement in the trade is an endless learning curve, since there is always more knowledge which may be added to our store. Our sincere congratulations and thanks to the Producer and to all those taking part.